The energy of the Nine of Wands could be experienced merely as a sensation of relief from the Holiday week coming to a close, or it could be the end of some troubled situation you’ve been dealing with, and you made it through okay. Many times when I see the Death card followed by the Nine of Wands, it signifies, whatever ended...a situation, a relationship, a perspective or understanding, there was some lesson learned in the process. 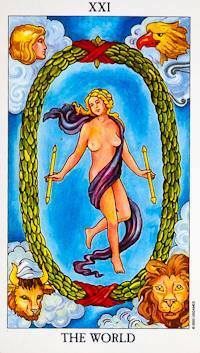 The Nine of Wands then signifies that, although what we went through may not have been easy, we are still standing. If your ending was more troubling than just the end of the holiday party, this card tells you that the Divine is assuring you... everything is okay. You Got this. 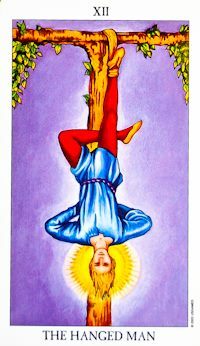 What a perfect day to sit back, observe and enjoy a break in the action... or in other words, when the Hanged Man appears, it signifies that we are in a holding pattern. It's a good day to meditate, to read, to spend time with family, and to be in the moment. If you're waiting for something to change, shift, or appear… know that synchronicities are happening behind the scene. When the energy is right, you’ll know it, and things will start moving forward again. What feels unfair today? What did not work out the way you expected it to? With the Holiday week upon us, may I suggest that finding ways to forgive anyone involved in any uncomfortable situations be your first course of action? Starting with self-forgiveness is always the best first step, and then, evaluate the circumstances with the fairness you feel you did not receive. Do your best to let it go, move on, and accept that not everyone will behave as you would like, respond as you would like, and most certainly, not care about the same things in the same ways you do. This card is perfect for this beautiful and powerful Full Moon, as well as this pre-holiday weekend. The World Card is all about completion and accomplishment. What does this powerful Full Moon energy mean for you? What has finally come to fruition for you? The World Card can signify the end of a very long work year, and today may be the first day of a well-earned vacation. Or, this could be about some pattern you’ve committed to changing... do you finally feel you're really ready to move on from it?? I say YES YOU ARE because that is what the World Card is here to say. 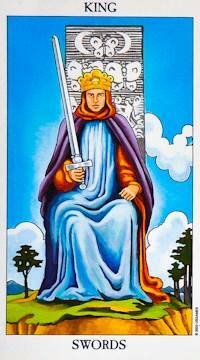 Or perhaps some relationship or commitment is ending... its okay, this card signifies that the end is purposeful... There is nothing left to learn from this situation. Whatever the case, know that this signals the end of a cycle, and heralds in the opportunity for something new, something even better. The World Card also is symbolic for travel, so if you are traveling this weekend, know that the energy of this card states, “Full Steam Ahead”!